Hoping to satisfy my chocolate craving, I walked from one end of Causeway Bay the other end in search for Awfully Chocolate. Little did I know that their location has been moved recently but the group still runs the same spot. No more chocolate, it now sells nothing but cheesecake hence the name Cheesess. With only 4 choices of cheesecake (New York, Sydney, Kyoto Raspberry and Kyoto White Cheesecake), it a sign of great confidence or over-confidence, depends how you see it. Similar to Awfully Chocolate, there was no display of any cake whatsoever, only images of their selection. 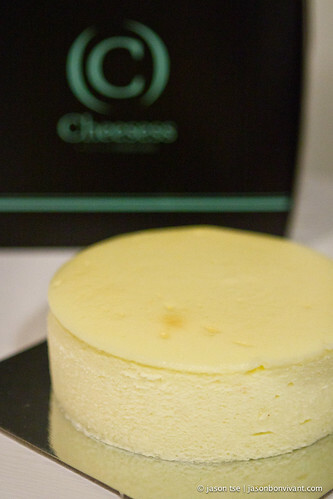 As recommended by staff, I picked one of its favorite items, the New York Cheesecake. Between small and large, I selected the small which set me back HKD138. Why do I mention price so early in my article? It is because it is an important element of my experience. 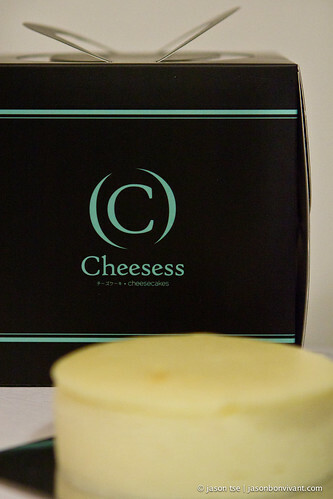 For HKD138, you get a small-sized New York Cheesecake just slightly wider than a quarter pounder or perhaps Filet-O-Fish. Any cake with 4 inches in diameter seems to be reasonable but don't forget about its height!!! Value vs worth is a very personal matter which I cannot be the judge for all but for HKD138, I do expect getting a slightly bigger if not taller cheesecake! Did I mention the berries sauce cost you an extra HKD38 for a small jar? Calling it a New York Cheesecake is slightly misleading because it was definitely not a typical NY Cheesecake especially with its soft and crumbly texture. The cheesy flavor was on the lighter side, perhaps adopting to the local taste buds. One does not require a fork to eat this, a simple spoon would do the job. It was good enough by itself without the sauce as a simple snack after meal and I guess the lighter cheese flavor made it so. Should you compare this with so-called traditional New York Cheesecake? or Should this be considered an alternative, slightly deconstructed New York Cheesecake? It is really up to you because I am unable to pick an answer myself. I personally enjoyed it for what it was, not necessary as a New York Cheesecake but a cheesecake in general. The bottle line is, Cheesess is worth a try (especially the other 3 choices which I am yet to try) but it would not be a weekly visit, perhaps once every 2 - 3 months? I truly hope their cheesecakes can be slightly more generous in size or at least in height!!!! PLEASE! !